Randy Schilling is the President and Chief Executive Officer. Schilling is the former Chief Executive Officer and Founder of Quilogy, a Microsoft nationally managed system integrator, which is located in historic St. Charles, Missouri. Schilling founded Quilogy in 1992 under the name Solutech, Inc. with a personal investment of $5,000. Under Schilling's leadership, the company grew to over 500 employees and 16 offices. 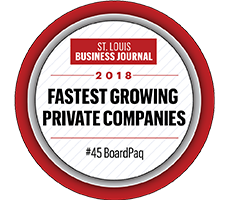 Prior to founding Quilogy, Schilling spent two years in the St. Louis office of the management-consulting firm Grant Thornton. Schilling earned a Bachelor of Science degree in Electrical Engineering from the University of Missouri-Columbia in 1985 and a Master of Business Administration from the University of Illinois- Springfield in 1989. Schilling currently resides in his hometown of St. Charles, Missouri. He is active locally in a wide range of business and civic organizations, including: founding OPO Startups, a co-working center for digital startups located in the "1909 Old Post Office" building in historic downtown St. Charles; serving as a director of CASS Information Systems, (NASDAQ: CASS), the nation's leading provider of transportation, utility and telecom invoice payment and information services; and serving as a chairperson on the Education Committee of St. Charles County Partners for Progress, a group of leading business and community leaders that encourage commerce and growth in St. Charles County. Alan Groh serves as the Chief Technology Officer. He has been working in the technology field for more than 40 years and specialized in commercial software development, infrastructure architecture & management, enterprise software, product management, development process improvement and project management. He currently directs software development & testing, infrastructure, and product management, specializing in cloud and mobile technologies. Groh held executive management positions during his 18 years at Quilogy as Chief Financial Officer and Chief Technology Officer. Previously, he held senior technology positions at Sauer Computer Systems in St. Louis, and was a partner in an early-stage computer service bureau in Illinois. Groh earned a Bachelor of Science degree in Electrical Engineering from Washington University in St. Louis. Our friendly, dedicated staff works to earn your business each month. Staff provides customized training sessions, conducts online demonstrations and maintains customer relationships while catering to each customer's needs. The BoardPaq staff continually strives to advance BoardPaq by implementing and updating new features. BoardPaq's staff is diverse with specialists in technology development, customer service, design and media. We collaborate with each client to provide your Board of Directors with the ultimate experience. Our advisors serve on public, private and nonprofit boards based in the United States. BoardPaq advisors work with our executive team to oversee BoardPaq's direction and performance. Our advisors believe in empowering boards of all types to be great by providing modern systems that meet their needs.